ROME – Yet another defeat in AS Roma’s shambolic opening to the season left fans fuming at the Stadio Olimpico, even though other results guaranteed the Italian side’s place in the last 16 of the Champions League. 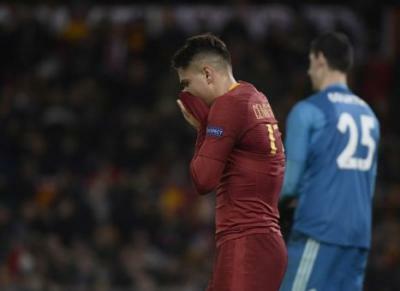 Just three days after suffering an embarrassing 1-0 defeat away to Udinese, Roma once again showed their inability to convert chances against a clinical Real Madrid side. Without the injured Edin Dzeko, replacement Patrik Schick struggled to make the most of his opportunity in the starting line-up, extending his run to nine games without a goal in European competitions for Roma. Two close-range miscues from the striker, accompanied by Cenzig Ünder’s glaring miss from just six yards on the stroke of half-time, summed up Roma’s night in front of goal. Despite showing plenty of attacking spirit, they just weren’t able to make an indent on the scoreboard. At the other end, Madrid showed their class when presented with the opportunity, two clinical finishes shortly after half-time wrapping up the game. Gareth Bale, given more freedom this season after the sale of Cristiano Ronaldo to Juventus over the summer, made defender Federico Fazio pay for an error at the back in the 47th minute, calmly slotting the ball past Olsen to open the scoring. A lovely move from the defending champions 12 minutes later culminated in an easy tap-in for Lucas Vasquez. The other result in Group G, a 2-1 victory for Viktoria Plzen over CSKA Moscow, ensured Roma’s qualification for the next round of the competition, despite their loss to Madrid. On the same night, Juventus booked their place in the last 16 with a positive result against Valencia. The Italian champions, starting with the formidable attacking trio of Cristiano Ronaldo, Mario Mandzukic and Paolo Dybala, were surprisingly unable to make many inroads in the first half, as the Spanish side defended strongly. A point-blank save by ‘keeper Wojciech Szczesny on the brink of half-time proved to be hugely significant, as Juve improved after the break They soon opened up the Valencia back-line as Ronaldo found space for a cross, which Mandzukic duly finished, the Croat’s third goal in as many games for the Old Lady. The result also guaranteed Manchester United’s qualification, following their injury-time winner against Young Boys.